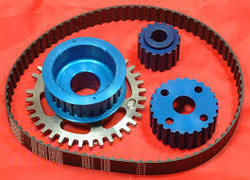 Prominent & Leading Manufacturer from Kolhapur, we offer drive pulleys. Backed by talented & skilled professionals and rich industry-experience, we are able to provide a huge range of Drive Pulleys that is located at the discharge terminus of the conveyor. These products are tested against different parameters to deliver flawless range to our clients. The products offered by us are available in different patterns and applicable in machinery, automobiles and mechanical parts.